On April 6, 2018 students at Narraguagus Jr./Sr. 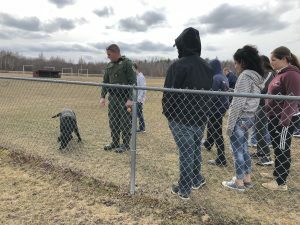 High School in Harrington, Maine got to experience a Teen Science Café (TSC) with local celebrity. Alan Curtis, of the popular TV show “North Woods Law,” was able to join us. The Teen Science Café was organized by students in the Youth Leadership Team (YLT) and 4-H Community Education Assistant, Sandy Copel-Parsons. The YLT includes students Armando Tort Hernandez, Yanet Paniagua, Tania Paniagua Ortiz, and Anyelis Perez Padilla. 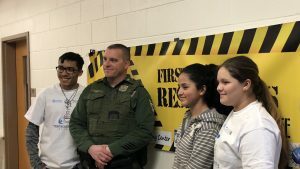 Alan Curtis talks to teens at an April First Responders Cool Café in Maine. Alan is a Maine Game Warden who works with his black lab, Sig, to monitor and protect Maine’s natural resources by enforcing inland fisheries and wildlife laws, investigating poaching and other crimes, and conducting search and rescue operations for people lost in the woods. While Alan is a dynamic personality himself, this TSC was focused on his canine partner, Sig, who uses a combination of natural talent and technology to locate everything from people to shotgun shells. Alan has an intimate connection to the DownEast Maine area, being born and raised in Machias. 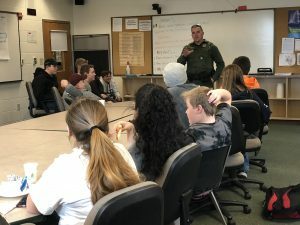 Students hung onto his every word as he described the trajectory he took to become a Game Warden. First, he volunteered with the fire department while he was in high school. He then fought big forest fires out west after he graduated, before applying to become a Game Warden. Alan Curtis and his dog Sig. Alan described his job as having a lot of technology that improves his ability to perform tasks essential to a Game Warden, but also noted that he has to rely on it failing. A Game Warden always needs to be prepared when entering the woods and tried-and-true methods like using a map and compass are incredibly important. However, Alan also uses GPS technology and mapping equipment in search and rescue operations to grid out and mark areas that have already been searched to pinpoint where someone might be located. Alan’s dog, Sig, also has a collar with a GPS tracker on it that relays the data to mapping software. Alan’s GPS tracks and Sig’s GPS tracks can be overlaid on each other to plot out which areas haven’t yet been covered. Because Sig is constantly riding along with Alan on patrols, Alan has a high-tech truck to ensure Sig’s comfort from the heat of summer to the cold of winter. By using an app on his phone, Alan can tell what temperature the truck is, the battery capacity, and whether it is running or not. The truck also has canine heat alarm sensors that will alert Alan by text if the temperature starts to become too hot. If the temperature continues to rise, the truck will turn itself on, turn on the AC, roll down the windows, and the siren and lights will come on. The students got to experience just how Sig works with a demonstration in the school field. Alan took a used shotgun shell and threw it out into the middle of the field. While waiting for the scent to wear off it, Alan showed the students his truck (complete with a dead deer in the back) and turned the siren and lights on to get Sig excited to “go to work.” Alan let Sig out of the truck, and after enthusiastically greeting all the students, he went to work finding the shotgun shell. Nose to the ground and zigzagging across the field, Sig eventually homed in on the shotgun shell, laid down next to it, and barked to indicate to Alan that he had found it. His reward for a job well done was playing fetch and running around with the teens. While Alan is a bit of a celebrity from his “North Woods Law” fame, Sig is also a local hero himself. He recently located the body of a murder victim in Fairfield, less than 10 minutes after the search started on the property.